Aeroporto Internazionale die Torino-Caselle is one of the most important airports in Italy by traffic volume. 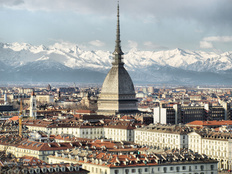 It is in the northwestern region Piemonte, bordering on Switzerland and France. Besides Turin airport piedmont also has a second smaller airport: Aeroporto di Cuneo. On the A5 to exit “Caselle”and then follow the signs to the airport on the SP2.